Otis stayed home from school yesterday and was in need of some mama-style comfort food. I found these faded handwritten recipes stashed away in my recipe box and knew they would be good medicine. My mom used to make this soup for our family and it has always been an old-school favorite of mine: the creaminess of the pureed corn plus the added cream delightfully warms the belly. In a stock pot, melt butter over low heat. Add whole chicken breasts and cook covered for 10 minutes, flipping once after 5 minutes. Cut chicken into cubes and set aside. Put 2 cups of corn in the blender with 1/2 cup of chicken stock. Puree until smooth. Dice potatoes . I leave the skins on because it is much healthier that way and I don't mind the heartiness they add to the soup. Add potatoes, chicken, stock, pureed and whole corn to the pot. Bring to a boil. Reduce heat to a simmer and cook partially covered for 15 minutes until potatoes are tender. Add cream and garnish with chopped parsley. Grind fresh pepper over the top and add salt to taste. I have always loved popovers. What is not to like? Have one to sop up your soup and another slathered with jam and butter for dessert! In blender mix eggs and milk until blended. Then add salt and flour and blend for 90 seconds. Add oil and blend for another 30 seconds. Grease muffin or popover tin. Fill half way with batter. Bake at 450 for 15 minutes. Reduce to 350 and cook another 20-30 minutes. Don't open the oven door until the last 5 minutes of cooking. Popovers should be a rich golden brown and crunchy on the outside when done. Let sit for a minute or so before removing. A note to my gluten free compatriots, this is the first time I have used gluten free flour to make this recipe. The insides were a little gooey compared to what I recall from my wheat-eating days. Nonetheless, they were eggy and delicious. This looks so delicous. I can't wait to try it. Thanks for sharing E.
So simple yet so elegant. I may make it tonight. Thanks! well, i made it last night and it was delicious. the popovers didn't pop as much and were a bit gooey inside but they were good none the less. I used less flour because i ran out. I'm going to try the popovers again soon. Thanks! 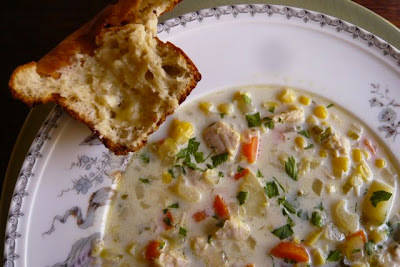 will try to make this corn chowder vegan! shouldn't be too hard to leave out the chicken and sub the cream. i love the simplicity of the recipe and am saving to my online cookbook right away (http://cookmarked.com)! Hey Sandi, good to know that coconut cream worked... reminds me of the thai coconut soup - so good!